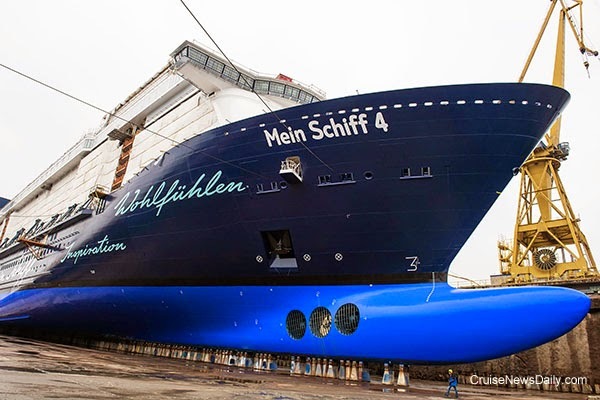 Meyer floated out Mein Schiff 4 at their Turku yard today, making this the first ceremonial milestone for a cruise ship since Meyer purchased the yard (in partnership with the Finish government) from STX. CND subscribers also read about Houston coming to life .. the Cunard bookends ... and everybody wanting to sail the Fun Ship. Meyer Werft floated TUI's Mein Schiff 4 at the Meyer Turku yard in Finland this afternoon. The dry dock will continue filling with more than 300 million liters of seawater overnight, and the ship will be towed to a finishing dock on Saturday morning. 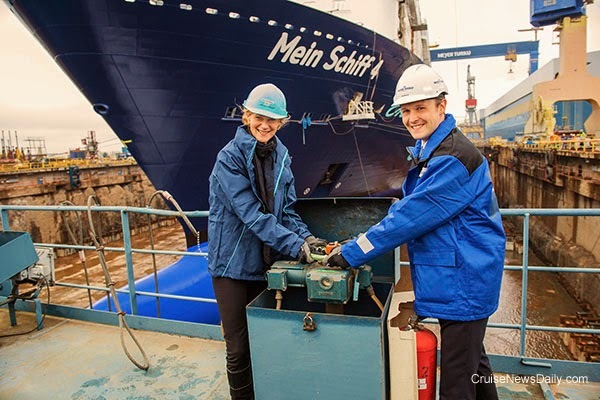 Mein Schiff 5 will enter service in June. Opening the valve are new TUI CEO Wybcke Meier and Dr Jan Meyer CEO of Meyer Turku. Photos courtesy of TUI Cruises. All rights reserved. May not be copied or used without permission. 10 October 2014 – We are familiar with the imposing Cunard Building in Liverpool – one third of the World Heritage listed Three Graces on the Pier Head – but today we take a look at the equally-imposing Cunard Building in New York. These two bookends on the Atlantic really do convey how important Cunard Line was. They were land-based versions of the Cunard fleet of ships themselves: solid, reliable, elegant and defiant. In New York, Cunard Line had maintained a presence on or near Bowling Green since the mid-nineteenth century. The company had been initially based at 4 Bowling Green for many years – the area was known as “Steamship Row” for the number of ticket-booking agents located there. “Steamship Row” was replaced by the United States Custom House in 1899-1907. 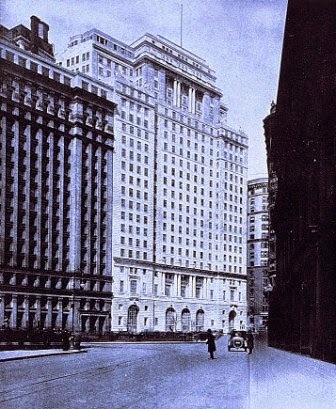 Consequently, Cunard moved offices to 29 Broadway and 21-24 State Street before relocating its headquarters to 25 Broadway. After the First World War, and with the Cunard Building in Liverpool open for business, it was time to establish a grand presence in the Big Apple – the largest city and busiest port in the world. The Twenty-five Broadway Corporation, with Cunard Steamship Line as the primary occupant, built 25 Broadway in 1920-1921. Architect Benjamin Wistar Morris, in partnership with his former employer architecture firm Carrere & Hastings as consulting architects, designed the building. 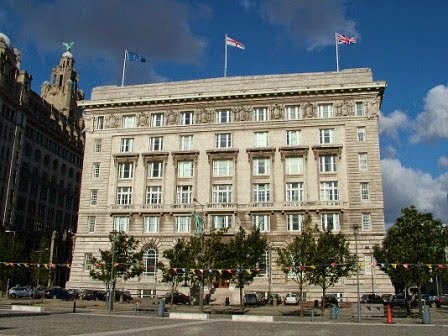 The 23-storey neo-Renaissance office building was completed in 1921 and Cunard moved in on 1 May. Morris won high praise for his design of the Cunard Building. In addition to Cunard, several other large businesses signed leases in the new building, including the Atlantic Gulf & West Indies Steamship Lines, Merchant Shipbuilding Corporation, Consolidated Steel Corporation and international Motor Truck Corporation. The building has a primary facade on Broadway, clad in Indiana limestone, and secondary facades on Greenwich and Morris. The four-storey base has five enormous arched openings, each with a carved keystone. The central section above the base is slightly recessed. 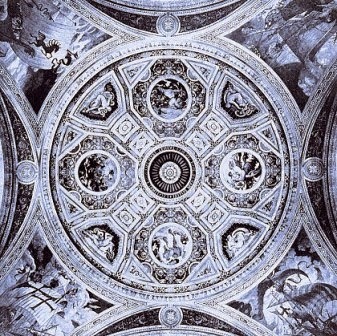 The upper portion of the base has an open gallery or loggia. The Morris Street elevation has a granite water table, two-storey limestone base, and a central court, which separates the limestone east wing from the tan brick and limestone-trimmed west wing. The Greenwich Street elevation has a granite basement above, which is a three-story arched opening with two metal balconies. 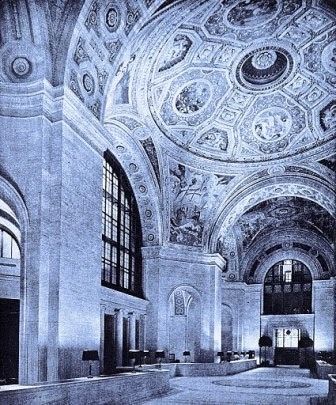 While the limestone facade is elegant, imposing and stately, the main building’s most impressive asset is the grand ticketing hall located in the lobby, which was designed for Cunard. It is inside this lobby where passage on Cunard liners was purchased. Morris collaborated with muralist Ezra Winter who produced a decorative program focused on shipping themes. The lobby is awash with starfish, seahorses, shells, sirens and Christopher Columbus’ sailing ships the Niña, the Pinta and the Santa Maria. The ceiling sculpture is by C. Paul Jenneweinn and the iron gates are by Samuel Yellin. Cunard vacated the building in July 1968 when they opened their new Head Office at 555 Fifth Avenue, where the company would remain until leaving New York for Miami in 1996. After Cunard left, the building remained vacant for a number of years until it was taken over by the U.S. Post Office in 1976. The Cunard Building was designated a landmark by the New York City Landmarks Preservation Commission on 19 September 1995. A major tenant today is Deloitte Consulting LLP. 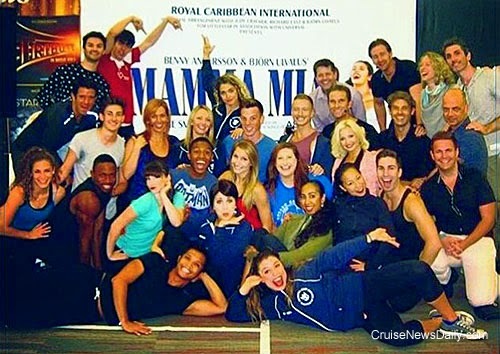 In case you haven’t heard, 2015 is Princess Cruises 50th anniversary. All year long, they’re going to be celebrating on all the ships. No matter when you travel during the year, you’ll be in on the celebration almost any time during the year. The Carnival Live concert series was a hit - so much so, Carnival has scheduled a second year of concerts, and today, they released the list of artists and dates for the first part of 2015. Cunard has added something to the 2015 fall schedule of Queen Mary 2 that has proven popular each time it’s on the books: a late autumn 13-day round trip from New York to the Caribbean. Not only that, but it’s bookended with transatlantic crossings which means passengers in the UK could sail a 28-day round trip from Southampton to New York and Caribbean (or Americans could squeeze in an off-season trip to the UK once the summer tourist have gone home). Cunard is also adding two late autumn two-week trips aboard Queen Victoria from Southampton to the Caribbean in 2015. CND subscribers also read about another idea for Venice ... waiting until next year ... the connection was made. Hurricane relief supplies from Carnival Miracle arriving at Cabo San Lucas this week. 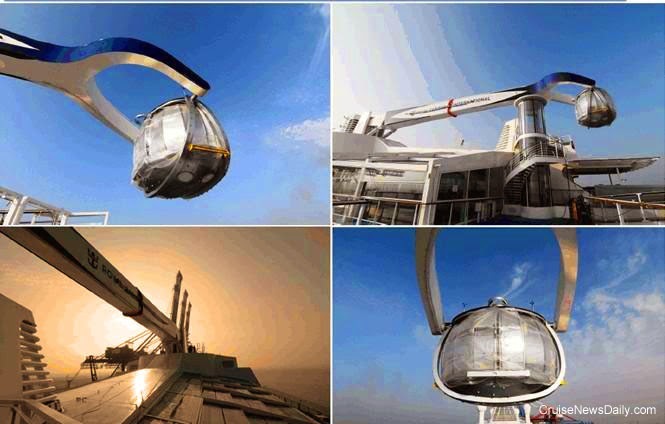 The North Star observation arm has now been installed atop Quantum of the Seas, and it's almost ready to let passengers have a look around. It's seen here in Bremerhaven yesterday. Carnival Corp today finalized the purchase of 7-acre parcel of land outside Amsterdam (in Almere) for a new training facility for all nine of their brands and outside customers. It will annually provide initial and recurrent training for some 6,500 deck and technical officers. The new facility, which is scheduled to open in 2016, will be three times larger than the current CSMART (Center for Simulator Maritime Training) facility Carnival began operating in Almere in 2009. CND subscribers also read about the advantages of a cruise come into play ... more needles on this cruise than at a knitting convention ... becoming a full-blown extravaganza ... and how they do it. 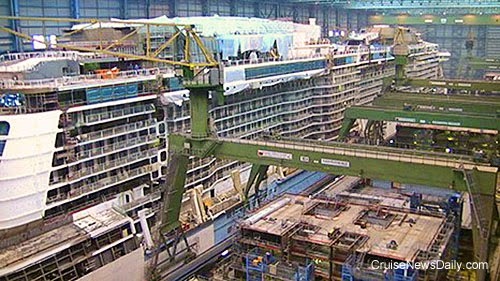 In this video, Royal Caribbean shows you Meyer Werft's unique process for building ships that allows them to keep turning out giant cruise ships so quickly. They demonstrate with Anthem of the Seas which a couple of months ago was still in (giant) pieces, and today is a fully-formed cruise ship. The Alaskan cruise industry is excited about what’s happening in 2015. Since the state changed their attitude to work with cruise lines a few years ago, the state’s industry has been showing years of positive growth, and next year it expects to mark the milestone of bringing one million visitors to Alaska. * Can You Inspire Princess Cruises? Can you inspire Princess Cruises to give you a free trip to the Rose Parade? And let you ride on their float? CND subscribers also read about Richard Kimble's new-found interest in Quantum of the Seas ... the possibility of getting pinched in Maine ... and where did that come from? Just lift Arm A and insert in slot Slot B. 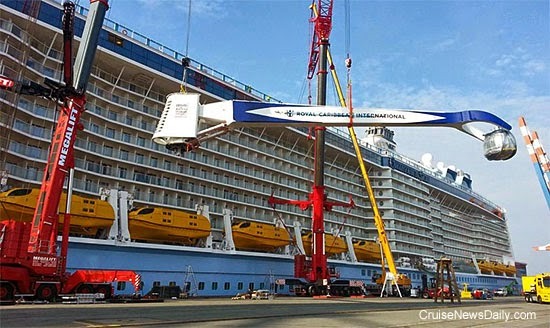 The North Star observation platform was installed on Royal Caribbean's Quantum of the Seas in Bremerhaven on Sunday (October 5, 2014).